Apple's Chief Executive Tim Cook has disputed tax figures presented by the European Competition Commissioner and stated the technology giant pays a global tax rate of 26.1%. In his first broadcast interview since the Commission ruled that Ireland granted Apple illegal state aid and must repay €13bn plus interest to the exchequer, he said he was "very confident" the findings will be overturned on appeal. Speaking to RTÉ News from California, Mr Cook said the decision was maddening and was not based in law or in fact and the scale of the tax bill to be repaid has shocked the company. The Commission's Competitions chief, Margrethe Vestager, told a news conference this morning that the decision was based on fact and was not political. The Cabinet met yesterday to discuss an appeal, something Apple has already indicated it would too. The Independent Alliance is expected to meet later to discuss supporting an appeal. The Cabinet will meet again tomorrow to discuss the matter having failed to agree a position yesterday. 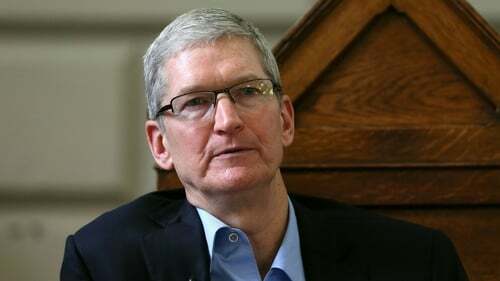 Mr Cook said the association of Apple with illegality brought outrage to the company. He described the investigation's findings as political and lacking any level of fairness and challenged tax figures presented by European Commissioner for Competition Margrethe Vestager at her news conference on Tuesday. Ms Vestager said Ireland's selective treatment of Apple allowed the company to pay an effective tax rate of 0.005% on its European profits in 2014. Mr Cook described that figure as false and untrue and said the company paid "a worldwide income tax rate" of 26.1% that year. He added that $1 out of every $15 paid in corporate tax in Ireland in 2014 was paid by Apple, making it the biggest taxpayer in the country that year. Asked if he believed that Apple paid its fair share of taxes, Mr Cook said he looked at the figure of 26.1% and he thought that was "a reasonable level". He confirmed that Apple will pay money into an escrow account and that the amount will be calculated using the formula devised by the commission. Apple's commitment to Ireland was undiminished and investment in this country will continue "as per plan", he added, and insisted there was no special deal between Ireland and Apple on tax. He described his company's relationship with Ireland as a 37-year-old marriage which had gone through "a pothole here and there" but was now thriving. He said Apple was being accused of doing something which was so foreign to its values it brought outrage. Mr Cook said Apple had nothing to apologise for and Apple and the Irish Government had done nothing wrong. Asked directly if Apple was given deals that were not available to any other companies, Mr Cook replied: "No - not a single time." And asked if Apple was treated differently to other companies, given special treatment and sweetheart deals, he replied: "No, never." Mr Cook said he was confident the Government will appeal the findings of the commission's investigation. He denied that Apple's announcement that the company is to lodge its own appeal was an indication of fear that the Government may not follow through on its own appeal. He said he was confident the Government will "do the right thing" and appeal. He also said he was satisfied that it would be clear to anybody who examines his company's tax affairs from an unbiased, non-political point of view that not only did Ireland and Apple do what was within the law, they did what was right too. Mr Cook said Apple was not going to allow what he described as an "invalid, politically-based ruling" to affect the company's deep commitment to Ireland. Apple expects to repatriate billions of dollars of global profits to the United States next year, Mr Cook said, without specifying exactly how much would be returned. Asked about the level of tax paid by Apple on profits in 2014, Mr Cook said $800m had been paid and that billions of dollars more had been provisioned and would likely be returned to the United States next year. "We paid $400m to Ireland, we paid $400 (million) to the US and we provisioned several billion dollars for the US for payment as soon as we repatriate it and right now I forecast that repatriation to occur next year," he said.